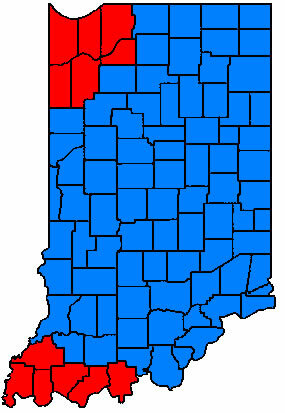 Most Hoosiers were reminded yesterday morning that Indiana is in the central time zone with Illinois. While most of the state actually changes their clocks to match New York, it makes more sense geographically to have our clocks set with Illinois instead. This became clear to me at 7:50, when it was still dark. The sun didn't fully come up until a bit later. Unfortunately, it appears the State Legislature is in need of a map. Economically, there is no reason that Indiana has to be with the East Coast. The traditional 8-5 work day overlaps with the Eastern time for eight hours. Having our time match geographical reality would not in any way impair Indiana businesses from engaging in commerce with the East Coast. In fact, putting us closer to the mountain and pacific time zones would put us more in line with the west than we are now. One of the stated benefits from switching to Daylight Savings Time is it would end confusion over what time it is in Indiana. Prior to implementing DST, most of the state spent the winter on the same time as New York and the summer on the same time as Illinois. But the haphazard way DST was implemented negated that. Allowing each county to choose a time zone resulted in the Naval base at Crane being an hour different from many of its own employees in neighboring Greene and nearby Monroe. Even now, the state is still split, as you can see from the map to the right. The southwest and northwest portions of the state remain in Central time, as they were before. If the justification is to eliminate confusion over what time it is in Indiana, it would make more sense for the Legislature to mandate that the entire state be in one time zone. Looking at a map and observing how dark it is in the morning immediately after we "spring forward" to DST indicates that we are in the central time zone, despite artificial lines drawn by politicians. I have heard a number of people complain about having a difficult time resetting their bodies to the new time when we switch. It is more difficult for some people than others, because they are much more affected by sunlight. Personally, I have not had too much difficulty adjusting to the switch until this year. For whatever reason, I had a difficult time adjusting this year and have been very sleepy as a result. As a humorous final note, my dogs strongly dislike switching from daylight time back to standard. This is especially true for Tera. If she could speak, I imagine she would be saying something like this: "Look. I do not care how you idiot humans artificially change your time. I get fed when it is dark. Look outside. It is dark now. WHERE IS MY DINNER?"